Hendrix Business Systems, Inc. Chosen As A 2018 Elite Dealer By ENX Magazine | Industry Analysts, Inc.
Toluca Lake, CA, December 4, 2018 — ENX Magazine and ENX The Week In Imaging announced that Hendrix Business Systems, Inc. has been selected as a 2018 Elite Dealer. This annual Who’s Who of the office technology dealer community, which is published annually, will be featured in the December issue of ENX Magazine. The 132-strong 2018 Elite Dealers were selected based on numerous criteria, including growth initiatives, innovative marketing programs, outstanding customer service, charitable contributions to the community, progressive workplace cultures and adaptability to an ever-changing market. 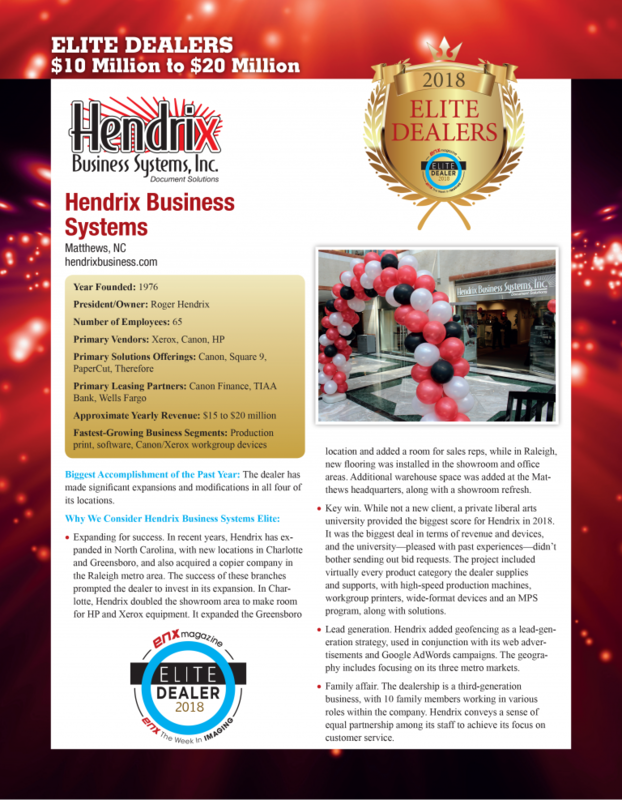 “We are ecstatic to be selected as a 2018 Elite Dealer by ENX Magazine,” said Roger Hendrix, President and CEO of Hendrix Business Systems, Inc. “Our team works hard every day to make things better in all aspects of our business. It is nice to be recognized by experts in our industry,” he continued. Hendrix Business Systems, Inc. is a privately held Charlotte-based technology company that specializes in providing businesses of all types and sizes with the highest quality imaging equipment and related software solutions. As an Authorized Canon®, HP® and Xerox® independent dealer, Hendrix Business Systems offers the most reliable brands available on the market today. Founded in 1976 as an office equipment repair service company, Hendrix Business Systems continues to operate with this same deep-seeded commitment to service by backing what they sell with award-winning service. Hendrix Business Systems, current and future clients can visit one of four fully operational technology labs and showrooms located in uptown Charlotte, Matthews, Raleigh, or Greensboro, North Carolina. On exhibition, are everyday office imaging and document solutions, such as, Multifunction Copiers, Desktop Printers & Scanners. Plus, High-Speed Production Printing Equipment and document finishing equipment, like paper Cutters and Folders. These high tech lab environments offer “proof of concept” for our customers looking to understand the benefits that their suite of hardware and software solutions are capable of providing. For more information, please visit https://hendrixbusiness.com/ . This entry was posted in Canon and tagged canon, ENX Magazine, Hendrix Business Systems by IA Staff. Bookmark the permalink.